When is World Mission Sunday? 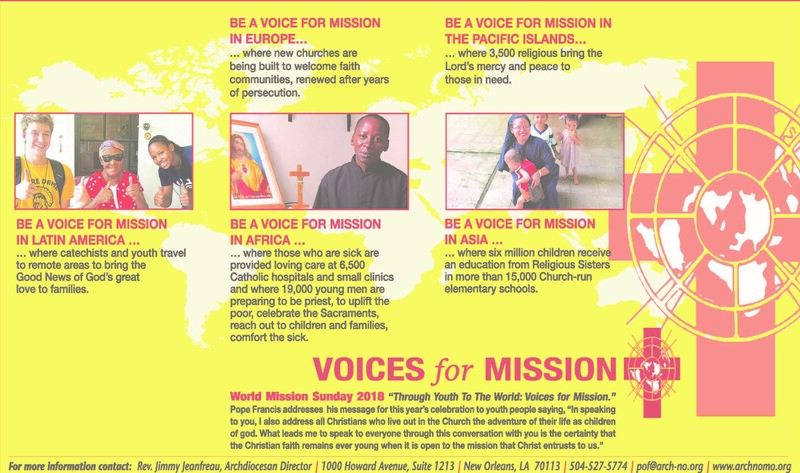 World Mission Sunday, organized by the Propagation of the Faith, is a day set aside for Catholics worldwide to recommit themselves to the Church’s missionary activity through prayer and sacrifice. 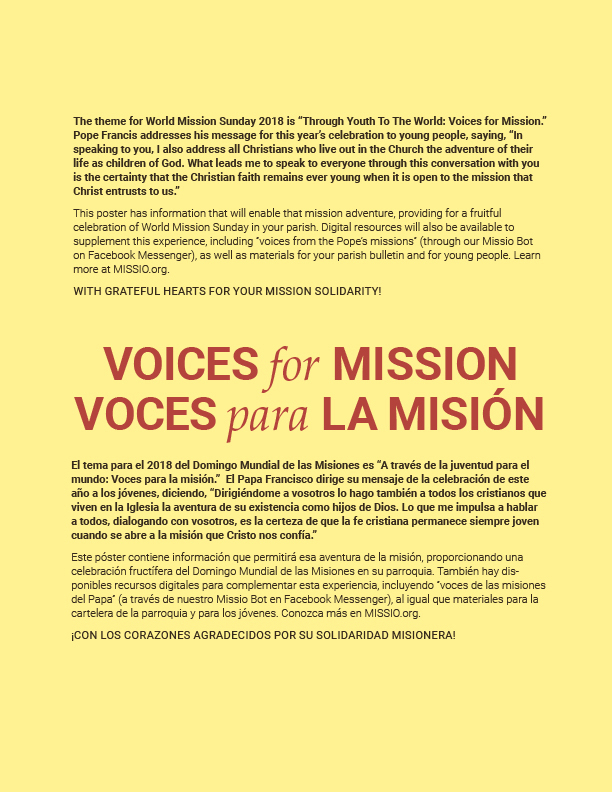 Annually, World Mission Sunday is celebrated on the next-to-last Sunday in October. As described by Pope John Paul II, World Mission Sunday is “an important day in the life of the Church because it teaches how to give: as an offering made to God, in the Eucharistic celebration and for all the missions of the world” (see Redemptoris Missio 81). Every year the needs of the Catholic Church in the Missions grow - as new dioceses are formed, as new seminaries are opened because of the growing number of young men hearing Christ’s call to follow Him as priests, as areas devastated by war or natural disaster are rebuilt, and as other areas, long suppressed, are opening up to hear the message of Christ and His Church. That is why the involvement and commitment of Catholics from around the world is so urgently needed. Offerings from Catholics in the United States, on World Mission Sunday and throughout the year, are combined with offerings to the Propagation of the Faith worldwide. Mission dioceses - about 1,100 at this time - receive regular annual assistance from the funds collected. In addition, these mission dioceses submit requests to the Congregation for the Evangelization of Peoples for assistance, among other needs, for catechetical programs, seminaries, the work of Religious Communities, for communication and transportation needs, and for the building of chapels, churches, orphanages and schools. These needs are matched with the funds gathered in each year. The world’s national directors of the Propagation of the Faith vote on these requests, matching the funds available with the greatest needs. These funds are then distributed, in their entirety, to mission dioceses throughout the world. 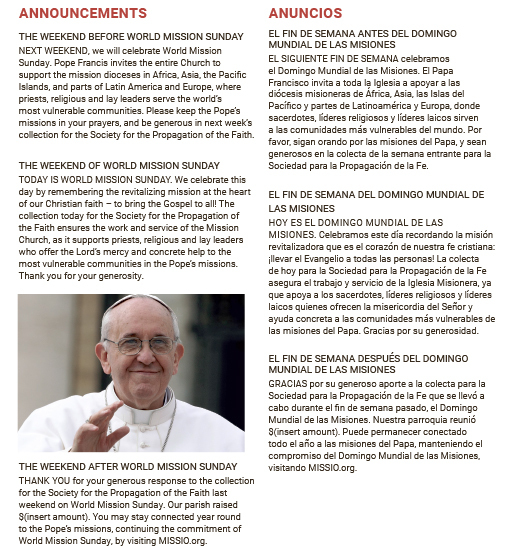 Your contributions to the Society for the Propagation of the Faith on World Mission Sunday and throughout the year help support pastoral and evangelizing programs, catechists and catechetical work, the building of churches and chapels, the work of Religious Communities in health care and education, and communication and transportation needs. Gifts provided on World Mission Sunday or at other times to the Propagation of the Faith help to ensure that the poor of the Missions receive help and the hope that comes from knowing of the love of Jesus Christ. The day-to-day service of the Catholic Church in the Developing World depends on such financial help.